Hearth Bread Line with Multi-Click Proofer | Naegele Inc.
baker would then manually fill his stone oven by putting the dough pieces on the oven floor by means of a long spoon. Various line types are possible, so first some choices have to be made: final proofing on flat surface or in baskets? If the answer is baskets, an additional variable has to determine the final concept choice: the number of different bread shapes, i.e. basket shapes. If the answer is: “one or two baskets”, the concept choice can be “Swingtray Proofer”. But if the answer is: “up to four different baskets”, the obvious choice is a “Multi-Click Line”. Each of these line concepts can be completed with a Cyclothermic oven or a Thermal Oil oven. 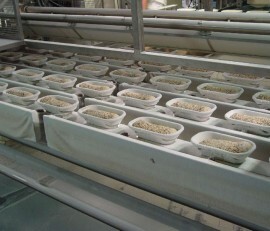 The baked products are cooled in Multi-Spiral system. When the bread type requires basket proofing, but there can be up to four different basket sizes, the solution is the patented Multi-Click concept. The heart of this system is a square carrier tube with baskets attached to it on all four sides. The length of the tube (Multi-Click carrier) equals the width of the oven. Each of the four sides of the square tube carries a different shape of basket. 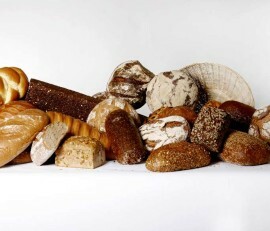 Depending on the bread type, one of the basket shapes is turned upward to carry the dough. Between the proofer and the oven, the Multi-Click manipulator will pick up each carrier and gently turn over the baskets to deposit the dough onto the oven infeed belt.